OJD usually enters a flock through the introduction of infected sheep (bought in or agisted) or stray animals (from infected neighbours). Sheep droppings and contaminated run-off can also spread the infection between farms once it has ‘seeded’ into an area. The risk of spreading infection via natural waterways and floodplains is also present. 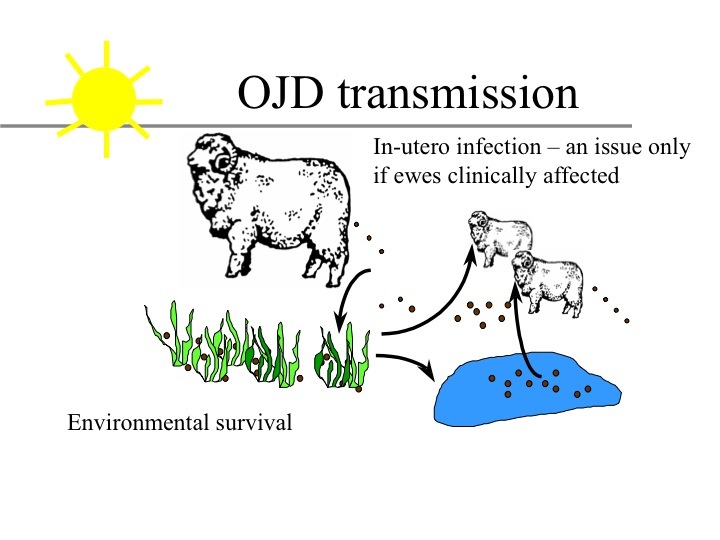 OJD bacteria are shed in huge numbers in the manure of infected sheep. Animals pick up the infection from contaminated pastures, water and teats. The bacteria can survive for many months in shaded environments. Sheep can become infected with OJD at any age, but are most commonly exposed and become infected as lambs or weaners, with deaths most often occurring in two and three year olds.